Sockeye salmon – Oncorhynchus nerka – Photograph courtesy of Brendon Spicer. 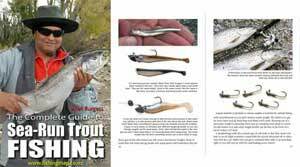 Most New Zealand freshwater anglers will have never seen a sockeye salmon. They are only found in the Waitaki River catchment, especially in lakes Ohau and Benmore, and in smaller numbers in lakes Avimore and Waitaki. These North Otago/South Canterbury sockeye salmon are thought to be the only population of the species in the southern hemisphere. According to Stella McQueen in A Photographic Guide to Freshwater Fishes of New Zealand, the sockeye salmon in Lake Ohau are smaller than those in Lake Benmore because Ohau has less food available for them. Although the sockeye population in the region is landlocked they move out of the lakes and into gravel rivers and streams to spawn in the Autumn. In their native North America, Kamchatka in the Russian Far East, and in rivers of northern Japan, sockeye salmon are anadromous (they hatch from eggs in freshwater, migrate to sea, where they spend most of their lives, before returning to their rivers of origin to spawn and die). Landlocked populations are also found in North America. There is no evidence the New Zealand population has ever been sea-running. All sockeye salmon in this country are landlocked fish. New Zealand’s sockeye salmon population was thought to have died out back in the 1980s, but now appear to have increased in number and expanded their range. They have now been seen in nearly all of the rivers and streams flowing into Lake Benmore and the lower Ohau River. They are also present in the Twizel, Fraser, and Tekapo Rivers. One of the best spawning areas for sockeye salmon is Larch Stream, which runs into Lake Ohau. Where sockeye salmon are present they provide forage for other trout species. 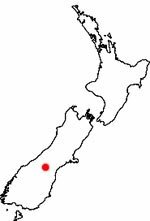 Sockeye salmon were introduced into Lake Poerua near Lake Brunner, Westland, in 1985 by the then West Coast Acclimatisation Society. As far as anyone is aware they failed to become established there. Sockeye salmon are not usually taken by anglers even when the are present in a particular water. They are filter feeders living on plankton. It is quite possible to fish regularly in Lake Benmore for example without ever catching one! They generally will only take a fly as an aggression response when in spawning mode in late summer and autumn. Sockeye salmon are most likely present in Lake Tekapo and other waters in the Waitaki River catchment not mentioned in this article. This sockeye salmon was taken on the flyrod by Jamie Blair near the boat ramp in Lake Benmore. Photograph courtesy of Jamie Blair. Click for larger version of this photograph. The name sockeye derives from an anglicised version of their north American Indian name saw-kai or sukkai. The Russian name for sockeye salmon is nerka. The sockeye is the smallest of the Pacific salmons. Those found in the lakes of the Waitaki System are bright silver in colour with dark blue/grey spots on the upper body. Smaller lake fish especially, closely resemble rainbow trout. When fish migrate upstream to spawn in March they are more of a green colour, with a pink or reddish tinge which is darker in jack fish. Landlocked sockeye salmon in New Zealand do not achieve the brilliant red coloration of sea-run fish in their native North America. Like the landlocked salmon stocks in North America, sockeye salmon in New Zealand are smaller fish, usually reaching a length of about 300 mm and weighing less than a kilogramme. 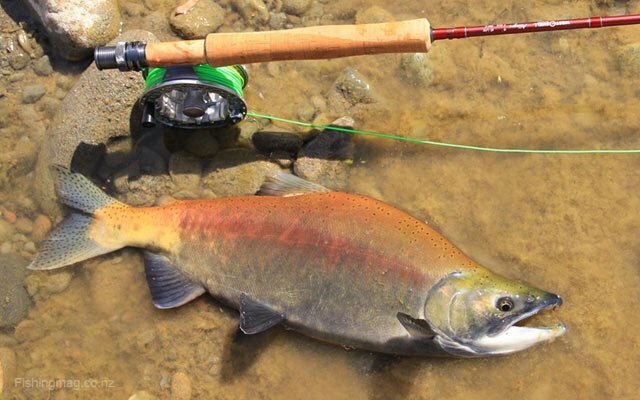 A big landlocked salmon in New Zealand could reach as much as 500 mm in length and weigh up to 1.8 kg. In North America where there is a canning industry for sea-run sockeye salmon, they can reach just over 800 mm in length and weigh 7 kg. Sockeye salmon were first brought into New Zealand as eggs in 1900 but unfortunately, all of them died. A second, consignment of 500,000 eggs arrived from Canada in 1902. According to the late Ron McDowall in New Zealand Freshwater Fishes – A Natural History and Guide, 160,000 of these ova arrived in good condition. The viable sockeye ova were hatched and reared at the government’s Marine Department hatchery on the Hakataramea River, a tributary of the Waitaki River. Some of the young sockeye salmon were released in different parts of the Waitaki River catchment, notably well upstream at Lake Ohau, others were retained for rearing purposes and released in later years as two and three-year-olds. According to McDowall, there was some discussion as to whether the ova received from Canada came from sea-run fish or landlocked stocks. It was clearly the intention of the New Zealand government of the day to introduce sockeye and Quinnat salmon for the purpose of building up a canning industry. So it must have been sea-running sockeye ova that was asked for. There is no evidence any of the sockeye stocks reared at Hakataramea and introduced into the Waitaki River system ever went to sea and returned. This raises the question of whether sea-run sockeye ova were actually sent from Canada. All the existing sockeye salmon in New Zealand today descended from that one batch of ova that arrived in 1902. Over the 2018 spawning season, Fish & Game used a helicopter to gain an increased understanding of the Upper Waitaki’s sockeye salmon run. They estimate the size of the run to be a very healthy 39,000 fish. The helicopter surveys will continue for the next two years, with Meridian Energy helping to fund them. Video from Fish & Game New Zealand. The most secretive of New Zealand’s sports fish, the sockeye salmon are spawning in the Mackenzie Country at the moment (March 2017). These fish, introduced in 1902 were thought to have disappeared in the 1980’s but have staged a comeback and are now found in ever increasing numbers and places than they were before.